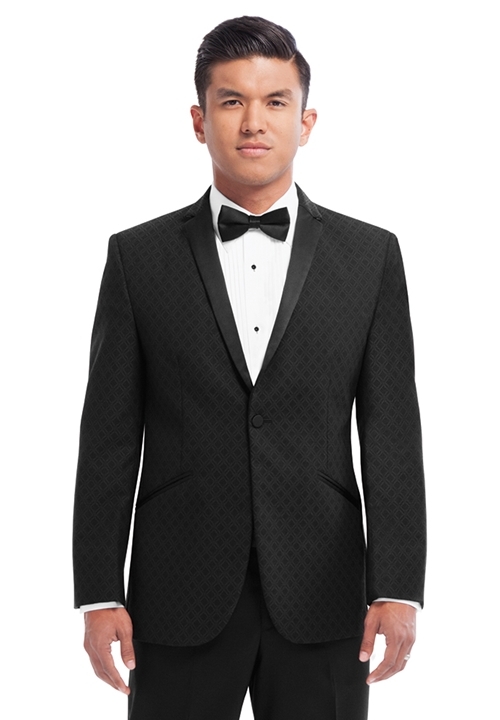 The black diamond 'Jaquard Illusion' 1 button notch tuxedo coat by Jean Yves is a sophisticated and modern formal choice. Featuring a 1 button single-breasted front, black satin micro-notch lapels with a self top collar, slanted satin besom pockets, non-vented back and fashioned from a diamond patterned black polyester fabric, this tuxedo coat is perfect for your prom, wedding, quinceanera, or other formal event. To our knowlege, this is the only coat ever constructed that allows you to say things like, "I'm kind of a big deal." and get away with it.